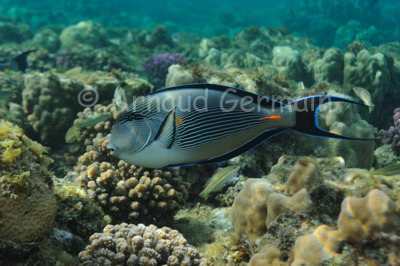 One of the prettiest fish in the Red Sea, the Sohal surgeonfish is hard to photograph whilst diving as it tends to stay on the top of the reef. I took this picture as I was snorkelling early one morning at the edge of the drop-off. These fish are quite shy too and move quickly, making it a bit of challenge to get a good picture. Nikon D700, Nikon 28-105 mm macro at 66mm, F8, 1/160th, ISO 400, Ikelite Housing and Ikelite DS160 strobe set on TTL -1.3EV. Marsa Shagra Bay, about 1 metre down, snorkelling, Marsa Alam, Egypt.